BIG meets monthly at The Comfort Inn of Sheepshead Bay. New members always welcome. Please call Steve Barrison at 212-750-5560 list to be notified about our next meeting, and patronize our supporters! Founded in 1992, Bay Improvement Group (BIG) is a not-for-profit 501(c)3 coalition of residents, businesses, and community groups dedicated to the preservation, revitalization, and comprehensive planning of Sheepshead Bay, Brooklyn, and its main streets. Founded in 1992, incorporated in 1993, BIG is a non-profit, tax-exempt 501(c)3 organization with over 500 members. The founders of BIG have been actively involved in warning of over-development in Sheepshead Bay since the 1980s. We have consistently talked about over-development and congestion, and recommended tightened zoning regulations. We continue to see a great need for our community to come together and halt the destruction of our unique Sheepshead Bay. A half-mile of MUSIC, GIVEAWAYS & KIDS' FUN! BAYFEST DEPENDS ON SPONSORS & SUPPORTERS! OPTION 1: BY CHECK Download, print, and complete the BayFest Sponsor Form, indicating the sponsorship level you've chosen. Mail the completed form with a check to: Bay Improvement Group, 30 Dooley Street, Brooklyn, NY 11235. Please arrange for us to pick up the check from you if you are signing up after 5/1/2019! OPTION 2: ONLINE / BY CREDIT CARD Download, print, and complete the BayFest Sponsor form below. Return it to Bay Improvement Group by mail, fax, or email, as indicated on the form. Pay for the chosen level of sponsorship with a credit card by using the PayPal pulldown menu below. Join us & say "THANKS!" to those who contribute to our community! Four-Course Dinner including wine * Cash bar * Live DJ * Dancing *Surprise entertainment * Raffles * Fun for ALL! 2019 AWARDEES TO BE ANNOUNCED! OPTION 1: BY CHECK Download, print, and complete the BayFest Sponsor Form, indicating the sponsorship level you've chosen. Mail the completed form with a check to: Bay Improvement Group, 30 Dooley Street, Brooklyn, NY 11235. Please arrange for us to pick up the check from you if you are signing up after 5/1/2018! OPTION 1: BY CHECK Download, print, and complete the BayFest Sponsor Form below, indicating the sponsorship level you've chosen. Mail the completed form with a check to: Bay Improvement Group, 30 Dooley Street, Brooklyn, NY 11235. Please arrange for us to pick up the check from you if you are signing up after 5/1/2017! Click for BAYFEST SPONSOR FORM. To make a tax-deductible donation by credit card using a secure PayPal connection, please click "Applications & Links" in the upper left (above the big number). Click that link to join Bay Improvement Group or renew your membership, too! URGENT OVERDEVELOPMENT ALERT in Sheepshead Bay Special Use District Zoning area! NO! ENOUGH development here along the waterfront! We will not support this! Loehmann's on Emmons Avenue is bankrupt, as we predicted. Now the new property owner has applied for a variance here AGAIN to expand the building by another story! He bought the building and now is claiming "hardship" because the lower level was flooded by Sandy (just like we in the community predicted it would back in the nineties at the five years of BSA hearings!). Now he wants to build even BIGGER because of his bad business decision. All organizations who helped and new ones to preserve this waterfront Special Zoning District unique in all of NYC must come forward to help! We also want any land use attorneys with the guts to stand up to a wrong development for this hard hit Sandy area. Record Crowds, Attractions, Attention to Sheepshead Bay! SHEEPSHEAD BAY, BROOKLYN, NY. - With the support of Title Sponsor Investors Bank, Bay Improvement Group's 23rd annual BAYFEST, renowned as Brooklyn's largest waterfront celebration, gathered well over 100,000 along the half-mile of Sheepshead Bay piers this past Sunday, May 18, 2014, for a gorgeous six hours of free fun in the sun. Headlining on the main stage and playing to a wall-to-wall crowd, nationally ranked Beatles tribute band Strawberry Fields of Broadway fame performed a two-hour show of the Fab Four's music, playing vintage instruments and wearing costumes reminiscent of the legendary mop-tops' musical eras. Bookending the band were horn-heavy Amy Lynn and The Gunshow plus ultimate party band East Coast, with Big Mike Lynche ("American Idol") and Brooklyn's own Adriana Louise ("The Voice") as Special Guests. Indie/pop sensation Darnaa, backed up by a band that included two male dancers performing in sync, wowed the crowd on the "Darnaa & Friends" stage, which the artist donated and shared with fellow musicians to support the nonprofit event. Sixteen-year-old Battle of the Boroughs winner (Queens) Annika; Battle of the Boroughs finalists (Bronx) Nando Griffiths & Pure Fyah; high energy stage-stormers Giant Flying Turtles; and Investors Band, a group of musicians from BayFest's title sponsor that originally formed to raise money for charity, also performed. Tai Chi expert Master Stephen Lin and the Aviator Artistic Gymnastics Team rounded out the stage performances, while Two Cent Sam, Inner Situation, The Dragonflies, Boricua Guitar Power, Sarah Factor, Ryan Egan, and The Rock Cafe provided entertainment on the Sheepshead Bay piers. Gerritsen Beach native and American Idol contestant Nicole Hidalgo opened BayFest with the National Anthem. A Color Guard provided by the US Navy, a memorial ceremony to our Armed Forces and veterans, and a water display in Sheepshead Bay by the FDNY Fireboat added color, dignity, and depth to the event. The Famous Big Idaho Potato Truck, with its 12,000 pound potato on a 72-foot wide-load flatbed, was Selfie Central at BayFest. Vintage cars from the Antique Automobile Association of Brooklyn made for throwback fun, while Brainy Academy of Sheepshead Bay and A2Z Party Planners, along with a basketball toss and giant Bounce from Aardvark Amusements, left kids all smiles. kick off "Bringing Back the Bay," B.I.G's new initiative to support the local economy, volunteers raised BayFester's awareness of the wide variety of ethnic cuisine available in Sheepshead Bay by handing out hundreds of menus, at no cost to dozens of participating restaurants. To enhance the effort, IL Fornetto Italian Restaurant (2902 Emmons Avenue), OPera Turkish Cafe (2255 Emmons Avenue), and Apani Georgian Cuisine (1520 Sheepshead Bay Road) provided free samples of their fabulous fare--a first and welcome addition at the annual event. Local banks, real estate companies, summer camp providers, and other businesses were among the over fifty tables providing information, raffles, and giveaways at BayFest. As part of its ongoing "No Neighbor Left Behind" campaign launched in November 2012 to support Sheepshead Bay's recovery from Superstorm Sandy, B.I.G brought in twenty organizations and government agencies, including the American Red Cross, New York Cares, Build It Back, and OEM CERT, to provide disaster survivor assistance as well as emergency preparedness tools and training opportunities. Raffles included gift certificates for local restaurants; classes; tours; merchandise; admission tickets; plus a 50/50. One lucky Dad won the Special Raffle: a hotel voucher plus day-passes to Disney World in Florida. B.I.G members as well as volunteers from the local community, New York Cares, and We Care NY provided a full day of cheerful and much-needed assistance with setup, participant registration, program distribution, cleanup, and more to keep the half-mile of activities running smoothly. smashing success. You are what makes BayFest great! We also thank Stella Maris Fishing Station, "The Power of BayFest," located at Emmons Avenue and East 27th Street, for providing main stage power at BayFest and other B.I.G. events, and the boat owners who provided electricity to pier bands. See you next year on Sunday, May 17, 2015, for our 24th year, when we do it all again! If you would like to be involved in BayFest 2015 as a sponsor or volunteer, please email us at bigbayfest@gmail.com. Preliminary planning will begin in July 2014. Performers interested in participating in BayFest 2015 should watch our Facebook page at www.facebook.com/bigbayfest for announcements about how and when to apply. BayFest has been produced each year since 1992 by the Bay Improvement Group, Inc., a 501(c)3 not-for-profit coalition of residents, businesses, and community groups dedicated to the preservation, revitalization, and planning of Sheepshead Bay, Brooklyn. New individual and business members always welcome. Contact us for information on how to join or click "Application & Links" on the upper left of this webpage to download an application. PHOTO CREDITS: All photos courtesy of Michael Taylor (We Care NY), Mike Beitchman (Bay Ridge Entertainment), Mindy Gress, Laura McKenna (Bay Improvement Group) or Steve Barrison (Bay Improvement Group), as specified in the photo filename, except for photos of Darnaa, Big Idaho Potato Truck, and US Navy Color Guard. Video courtesy of Mike Beitchman. NOAA & NATIONAL WEATHER SERVICE SELECT B.I.G. Bay Improvement Group is proud to have been selected by National Oceanic and Atmospheric Administration (NOAA) and the National Weather Service (NWS) to be a Severe Weather Ambassador and assist them in preparing the public for severe weather emergencies. March 2-8, 2014 is National Severe Weather Preparedness Week. Here's what you and your family can do NOW to participate. Be a Force of Nature by knowing your risk, taking action and being an example in our community! Hurricanes, droughts, tornadoes, snowstorms, flooding – severe weather impacts every part of the country. The first step to becoming weather-ready is to understand the type of hazardous weather that can affect where you live and work, and how the weather could impact you and your family. Bookmark weather.gov to get the latest forecast information. Follow the National Weather Service on Facebook and Twitter. Read the State of the Climate reports to discover historical trends. Have little ones at home? Teach them about the weather with the Young Meteorologists Program. This is a free, online game where you go on a severe weather preparedness adventure and earn a Young Meteorologists Certificate. Be Force of Nature by making sure that you and your family are prepared for severe weather. This includes creating a disaster supplies kit and making sure that you can receive emergency messages. Obtain a NOAA Weather Radio. Learn about Wireless Emergency Alerts. Create a disaster supplies kit. Be a positive influence on your community by sharing your weather preparedness story. Be a Force of Nature by letting your friends and family know what you did to become weather-ready. Share your preparedness story on Facebook. We are checking on which of the following services are still available as of March 2014. Check back for updates! NEIGHBORHOOD REVITALIZATION MOLD REMEDIATION PROGRAM will directly help approximately 2,000 households in affected areas deal with mold left behind by water damage from Superstorm Sandy. Neighborhood Revitalization NYC will coordinate mold treatment work in 2000 homes by professionals (the rest will be done by volunteers). The treatment work will be conducted by environmental consultants, contractors, and not-for-profit organizations, and be staffed by volunteers. Apply by calling 855-740-6653 Monday through Friday from 8am to 8pm OR call 311. For detailed information, visit the LISC website. CATHOLIC CHARITIES 718-722-6223. They have received funding and so can help Sandy survivors with all kinds of stuff--money, furniture, appliances, repairs. Sign up to be one of their clients, but follow up if you don't hear back in the time frame they specify they will respond in. We know they've been backed up with hiring so many new people and registering so many residents, but you must also help them by advocating for yourself and not letting your application fall through the cracks. SALVATION ARMY Call (212) 337-7339 Very helpful with things like new furniture, furniture vouchers, vouchers for their stores, and gift cards. Like everything, they can only supply items as supplies last, so make the call. AMERICAN RED CROSS SUPERSTORM SANDY RECOVERY PROGRAM. Assistance with housing and needs not met by insurance, FEMA, or other resources. 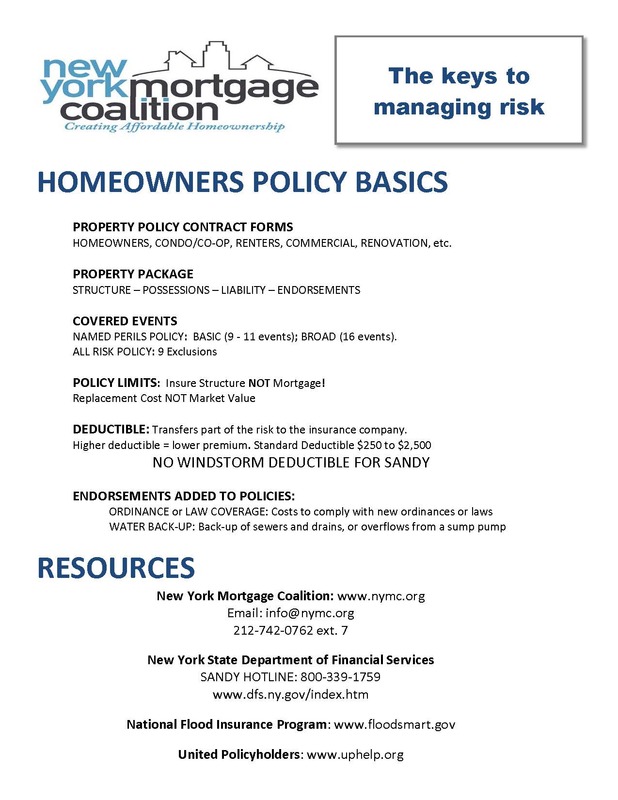 May include: security deposit, rent, and application fees; utility assistance, moving costs, brokerage fees, storage costs, minor home repairs to owner-occupied property, referrals to social services and counseling, assistance completing applications or insurance claims, identification of child care resources, furniture and appliances, providing connections to legal resources or new programs for Sandy recovery, and other assistance. All assistance subject to verification and documentation. superstormsandyny@redcross.org or call 877-RED-CROSS. GOV. CUOMO $10,000 GRANT. Homeowners who have received $31,900 from FEMA are automatically eligible for up to an additional $10,000 from Gov. Cuomo's program and do not need to apply. For info, call 855-NYS-SANDY (855-697-7263). NATIONAL GRID $1,000 PAYMENT. If you are a National Grid customer, you may be eligible for a $1000 payment. For complete information, go here. Contact National Grid directly Monday through Friday between 8am and 8pm at 877-696-4743. TEMPORARY WAIVER OF FEES FOR REPLACEMENT BIRTH CERTIFICATES, MARRIAGE LICENSES, ETC. On November 9, 2012, Governor Andrew M. Cuomo issued Executive Order 69 which temporarily suspends specific provisions of statute to facilitate the replacement of certain documents which may have been lost or damaged as a result of the recent disaster associated with Hurricane Sandy. Specifically, residents of counties declared as disaster areas (see list of counties below) who need to obtain replacement certificates of birth, death, fetal death, marriage, or divorce will be able to do so at no cost. INSURANCE ISSUES. Call NY State Dept. of Financial Services 8am-8pm: 800-339-1759. Find a public adjuster to deal with your insurance company: http://www.nypaa.com Learn what public adjusters do: http://www.dfs.ny.gov/insurance/homeown/html/hmpubadjust.htm. Check if a public adjuster is licensed in NY https://myportal.dfs.ny.gov/nylinxext/elsearch.alice. Public adjusters may not solicit business between 6pm and 8am, and may not charge more than 12.5% of any recovery. You may cancel the agreement within 3 business days of signing it. Still having problems? Email Martin Schwartzman at martin.schwartzman@dfs.nys.gov.